This rendering shows the location of the gasoline tank on 1993-2004 Jeep Grand Cherokees, positioned between the rear axle and the bumper. Nobody claims to have a foolproof modification to eliminate the alleged fire safety risk in 2.7 million 1993-2007 Jeeps that have put Chrysler Group at odds with the National Highway Traffic Safety Administration. And each approach to the alleged problem has its shortcomings, according to the engineers who study such things. Here's the challenge: The plastic fuel tanks in both the 1993-2004 Jeep Grand Cherokees and the 2002-2007 Libertys under scrutiny are located between the rear axle and the bumper. 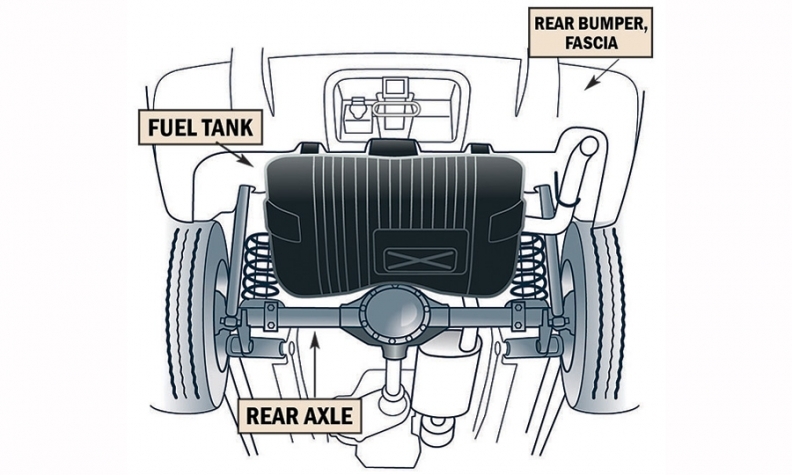 Rear-end collisions at high speeds can puncture the tank, causing fuel leaks and fires. These days, because of tougher government standards for tank integrity, nearly all tanks are installed in front of the rear axle. But in the 1990s it was common for rear-wheel-drive vehicles to have fuel tanks positioned behind the rear axle. Dennis Virag, president of Automotive Consulting Group Inc. in Ann Arbor, Mich., said: "No matter how much engineering you do, if you have a high-energy impact, you are not going to stop all fires, even on vehicles with tanks ahead of the axle." Here are some of the potential solutions -- and the new potential problems they create. Install a check valve in the fuel tank. A check valve shuts off the flow of fuel when a vehicle flips or the tank is dislodged. But fuel still could leak if the tank is punctured. In one Grand Cherokee crash, a motorcyclist lost control and slid under the SUV and sliced open the tank, causing a fire. A check valve would not have prevented fuel from leaking in that case. Modify the fuel filler and hoses to withstand rear-end crashes better. The fuel filler neck is integral to the tank and can't be easily modified. Fuel hoses could be modified, but fuel still could leak if the tank is ruptured. It's not possible to relocate a retrofitted tank in front of the rear axle. There isn't enough space for the tank ahead of the axle, and the vehicles were not designed and crash-tested to comply with that layout. Another nonstarter, cited in some media reports, is the installation of a skid plate under the tank for protection. But skid plates, such as the one Chrysler offered for off-road enthusiasts on the Grand Cherokee, are meant to protect the bottom of the tank from rocks and other off-road debris and aren't designed to deflect energy or prevent the tank from moving in a severe crash. Also, attaching a skid plate so it wouldn't interfere with other parts could be problematic. And retrofitting a skid plate could introduce new safety problems in other types of crashes, such as side impacts, and would add weight, which could affect handling. Perhaps the best option, should Chrysler decide or be forced to modify the fuel tank, would be to install a stronger tank with a flexible fuel filler neck, built-in check valve and modified fuel lines that would fit in the same space as the old tank. A stronger tank could be designed to withstand the current government-mandated 50-mph rear-end collision without leaking. But the cost could reach $1 billion if Chrysler replaced tanks on 80 percent of the 2.7 million vehicles still on the road -- a typical rate for recall repairs. Joe Phillippi, president of AutoTrends Consulting, in Short Hills, N.J., said there's no obvious solution "without major surgery, which would be prohibitively expensive."